While rummaging through the trash in the dumpster behind a trendy café in Lower Manhattan, Bob the Coyote couldn’t believe his good fortune when he found a coupon for a free beverage of his choice stuck to a piece of smelly cheese. 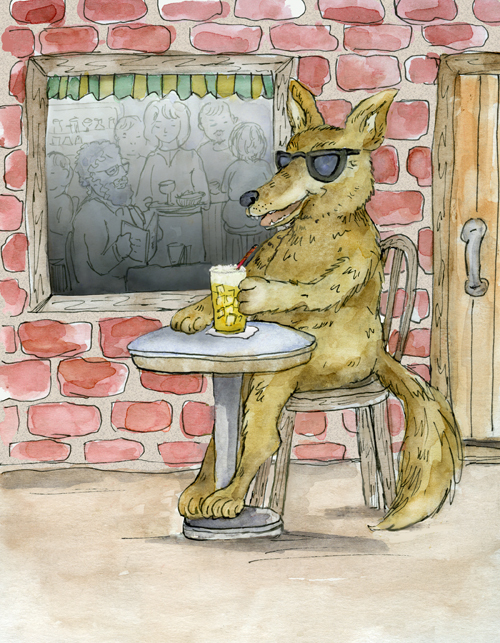 Bob settled into a sunny sidewalk seat and being a coyote of some refinement, he ordered an icy cold Salty Dog to relax before retreating to the comfort of his den on the top floor of a nearby parking garage. After checking his ID and his rabies vaccination tag, the waiter graciously accepted the coupon and brought Bob his drink. You see, in the wake of a recent incident in Norwood, N.J. where a man was bitten by a coyote thought to be rabid, the New York City Department of Health and Mental Hygiene began requiring that any canid frequenting an establishment serving food and beverage had to be vaccinated against rabies. This regulation came after a scientific determination that the herd immunity effect did not apply to packs of coyotes. New York is a progressive city that takes pride in its diversity and Mayor Bill de Blasio has granted coyotes a special status as “citizen canids” with all of the accompanying rights and privileges. It has been reported that newly reelected Chicago Mayor Rahm Emanuel is looking into a similar program for the Windy City’s estimated 2,000 resident coyotes. The folks of the Big Apple can expect to be sharing more of their fair city’s fine dining establishments with their furred quadruped compatriots as the southward migration of coyotes from wooded areas of the Bronx continues to feed the exploding coyote populations in Brooklyn and Manhattan.